Oberdan Bezzi, renowned designer has recently made some interesting concept sketches for motorcycle fans. One of his works, namely BMW S1000 'Lightburner' concept. His work does not disappoint, because the present is very good. 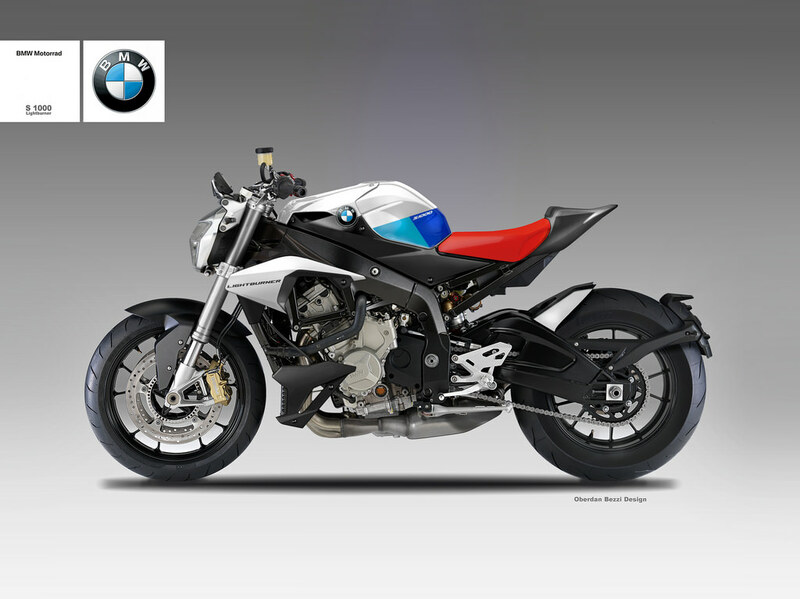 Yes, the design concept was based on the BMW S1000R streetfighter. The BMW motorcycle, said to be suitable to adopt the naked style that are popular today. Interestingly, the motorcycle use 16-inch racing wheels with small size tire in the front section, and big size of 230 at the rear. Although look astonishing with the legs mounting are eccentric, but the design is impressive and spoil the eye of the beholder. The bike, then merged with the style and color that describe the greatness of BMW's color ie silver, blue and black. The bike seat themselves appear attractive to the adoption of the red color became more conspicuous. At the stern, the motorcycle is embedded a lights of the MT-03. Meanwhile, a small cape near the tank plucked from Aprilia Tuono V4. As a result, the figure of BMW S1000R is also appear violent and futuristic.